Often it's the smallest details that can create the biggest impact. That's true in life and it's true when planning an event. Because how people experience and enjoy events - and how they remember them - has much to do with the details, details are an important part of planning an enjoyable and memorable event. 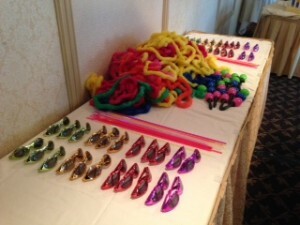 Our party extras will help your event stand out! Party props can really tie an event together - they create great photo ops and entertainment for your birthday party, corporate event, bar/bat mitzvah, wedding or other special occasion. ask about our wide selection of party props to add the fun finishing touch to your shindig! Available in standard 20, 40, and 60 piece packages. Custom Size Packages also available. GLO Bands For Your Next Event! GLO BANDS change color and are synced to the music. Great Party Favor - Add your personal monogram or logo! Ask about adding a special entertainer to your party or event!